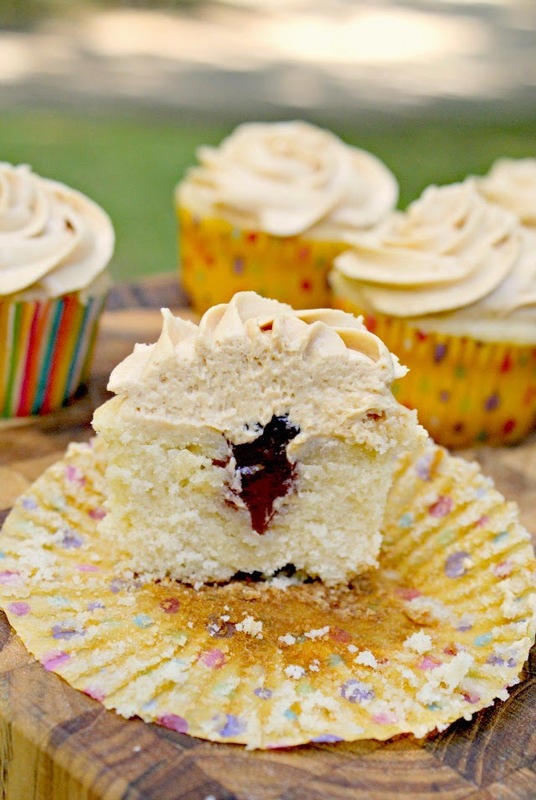 Peanut Butter and Jelly Cupcakes are moist yellow cupcakes with creamy peanut butter buttercream frosting and a sweet jelly center. Ever year for my kids' birthdays I make cupcakes. My mother-in-law makes the big cake for the official birthday party, but on most years, the party isn't actually on their birthday. On their birthday we stay home and I cook their favorite dinner and then we have the cupcakes so that they we can sing and blow out the candles on their special day. Then they get to do it all over again with Grandma's cake at the big party with all of our family and friends. This year my little guy turned two and I decided to put a twist on his cupcakes. His favorite sandwich is PB&J, so I figured I would make him PB&J cupcakes! I knew they'd be perfect for him. I used a basic yellow cupcake recipe, which turned out absolutely perfect. Light and moist. Then I used the poke technique from my Triple Chocolate Poke Cake recipe to make a hole for the jelly. You can see the cupcakes with the holes poked in them in the photo above. Great idea, right? That way the jelly is a little surprise when you bite into them. I'm already brainstorming all of the deliciousness I'm going to pipe into my future cupcakes. 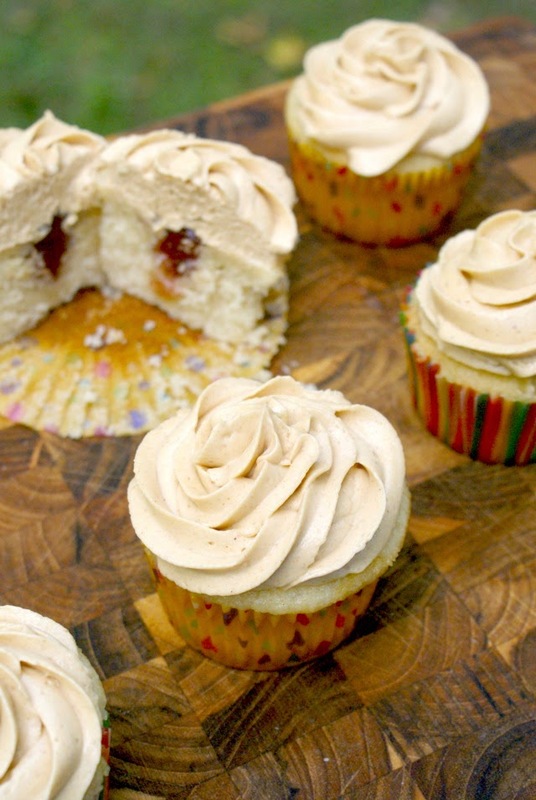 A yummy creamy peanut butter frosting topped these little beauties and was the peanut butter component of the cupcakes. Frosting is super easy to whip up and make at home. If you don't make your own frosting, you should totally try it! I have always said that I'm more of a cook than a baker. And cake really isn't my favorite dessert, if I'm going to be honest. But these cupcakes came out SO good that I think my baking skills are seriously improving! So good, in fact, that I, the non-cake fan, could have easily eaten two or three of them. You'll love the classic flavor combo and the sweet jelly surprise in the middle! If you have a peanut butter and jelly lover in your family, these will be the perfect treat for them! Preheat your oven to 350 degrees. Line 22-24 muffin cups with paper liners. In a large mixing bowl, cream the butter and sugar until light and fluffy. Add the eggs, one at a time, beating well after each addition. Beat in the vanilla. In another bowl, whisk together the flour, baking powder, and salt. Add the flour mixture to the creamed mixture alternately with the milk, beating well after each addition. Fill the muffin cups 3/4 full. Bake for 15-20 minutes, or until a toothpick inserted in the center comes out clean. Cool in the pan for 10 minutes before removing from the tin to a wire rack. Cool completely. 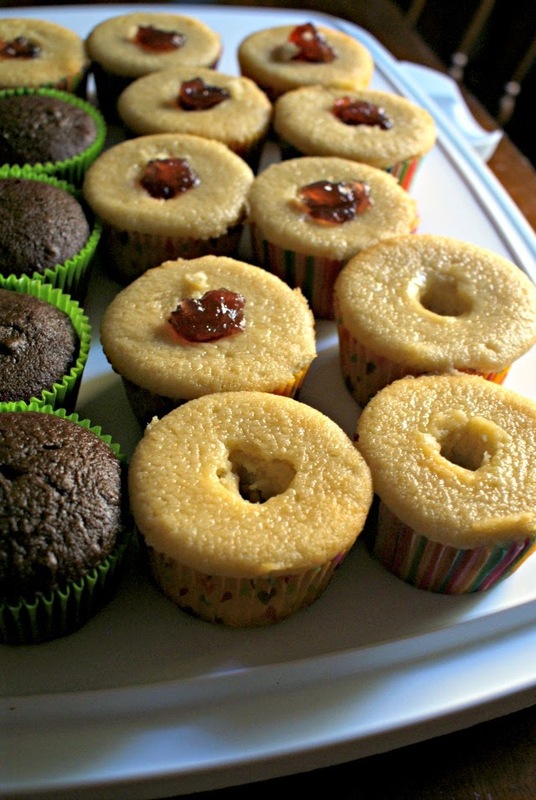 With the handle end of a wooden spoon, poke holes into the center of the cupcakes. Pipe jelly into the center of each cupcake. To make frosting: In a mixing bowl, beat the peanut butter and butter until light and fluffy. Do nor over-mix. In a liquid measuring cup, combine the milk and vanilla extract. Add half of the milk mixture and half of the powdered sugar to the bowl and beat on low speed until just incorporated. Scrape the sides and bottom of the bowl with a rubber spatula. Add the remaining milk mixture and powdered sugar and beat on low until just incorporated. Icing will be smooth and creamy. Don't over-mix! Frost the jelly-filled cupcakes with the frosting and enjoy! Source: Cupcake recipe from Taste of Home. Frosting recipe from People.com.